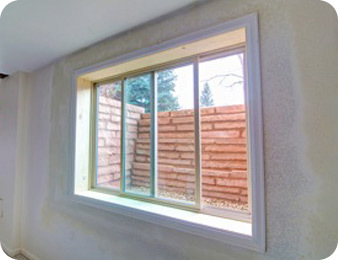 If building codes require structural modifications in order to install your new windows, all additions and modifications are performed under the direction of a licensed, professional engineer. Modifications are typically designed to support the vertical loads of the home, imposed over the opening and any lateral pressure exerted upon the foundation walls from backfilling and hydrostatic pressure. The structural work can vary, but the most common modification is the installation of steel lintels and vertical legs field-welded together, fashioned into the new opening to take the place of the concrete which has been removed. Over the years, we have gathered experience in a variety of structural enhancements including built-up wood headers and steel wall stiffeners, as required by the engineer of record. If your home requires structural modification to properly install new windows, we will take care of all necessary drawings, reports, planning and permits for you. The windows are great and there was NO DUST! The guys were super polite, fast and professional. Egress, Inc. is top notch."